It's possible to comfortably program and control your HeliaLux light units with your mobile phone, tablet or PC via WiFi using the HeliaLux SmartControl. Comfortably manage your individual daily routines with the browser-based user interface. The HeliaLux light units are controlled over the WiFi network. 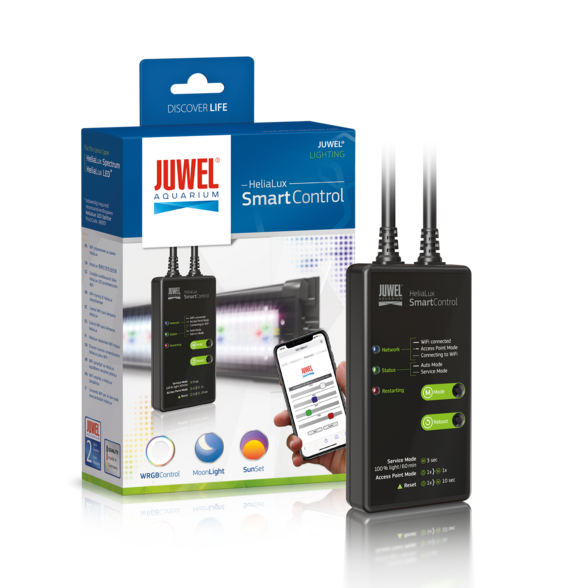 The controller makes it possible for you to adjust the lighting conditions in your aquarium to your needs. Up to 16 lighting phases in addition to the times for sunrises and sunsets may be comfortably and individually programmed for each day. Quickly and easily define the lighting moods in your aquarium depending on the time of day and create a unique atmosphere in your underwater world with this colour effect. The freely adjustable colour channels also permit individual moonlight settings to be specifically and individually made. The stable WiFi connection makes it possible to comfortably control and program the HeliaLux SmartControl from your mobile phone, tablet or PC. The matching HeliaLux splitters allow up to two HeliaLux LEDs or two HeliaLux Spectrum lights to be controlled simultaneously from a single HeliaLux SmartControl. Quickly and easily define your desired lighting mood by individually controlling your HeliaLux light units' separate colour channels. The HeliaLux Spectrum makes the colour channels white, red, green and blue available. The HeliaLux LED, on the other hand, allows the colour channels white and blue to be controlled. Individual daily routines entirely according to your wishes and needs. Sixteen adjustable light phases allow you to not only set the times for dawn, sunrise, sunset and dusk, but also to individually program additional light changes over the course of the day. It's also possible to define a break at midday at the desired time of day and light intensity. Memory for 8 light profiles. It's possible to define individual daily routines for every day of the week. Let the sun rise later at the weekend, for example, shorten the break at midday or extend the sunset. The LivePreview function allows you to see the light intensity you have set in real time while creating the programming for the aquarium. This function makes the creation of lighting profiles particularly comfortable. Pre-programmed daily routine including lunch break to enable you to quickly take the HeliaLux SmartControl into operation. Quick and easy adjustment of the factory light profiles is nevertheless possible at any time. Quickly and easily simulate the lighting mood you have set in your aquarium at any time of day. Move the slider throughout the course of the day to see what the light situation will be at the desired time in the aquarium. 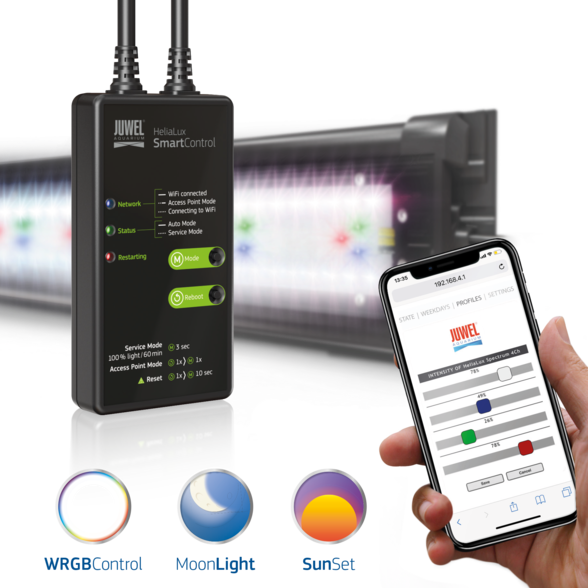 Wireless lighting control from all WiFi-enabled end devices. No app necessary. Simply use your Internet browser to directly control HeliaLux light units. Create optimum conditions for carrying out maintenance work in your aquarium. 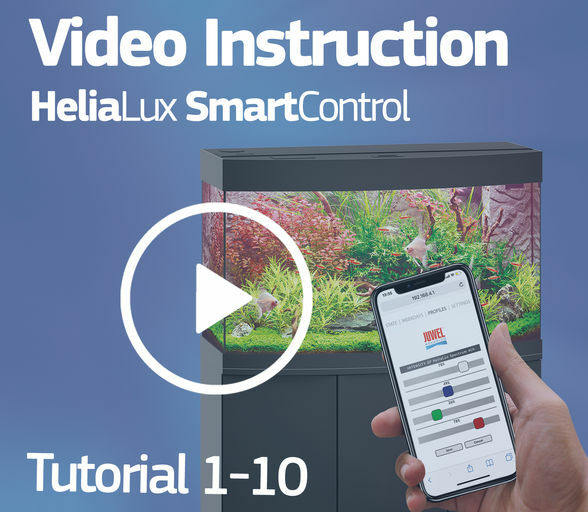 Activate the aquarium maintenance mode directly by using the control button on the HeliaLux Smart Control. Your HeliaLux will light up at 100% luminosity to enable you to work comfortably on the aquarium. It's possible to automatically update the system over an existing Internet connection. System updates help keep the system stable and deliver new features. The optionally available splitter makes it possible to use up to two HeliaLux lamps with one HeliaLux SmartControl. Which LED lighting options do I have for my saltwater aquarium? 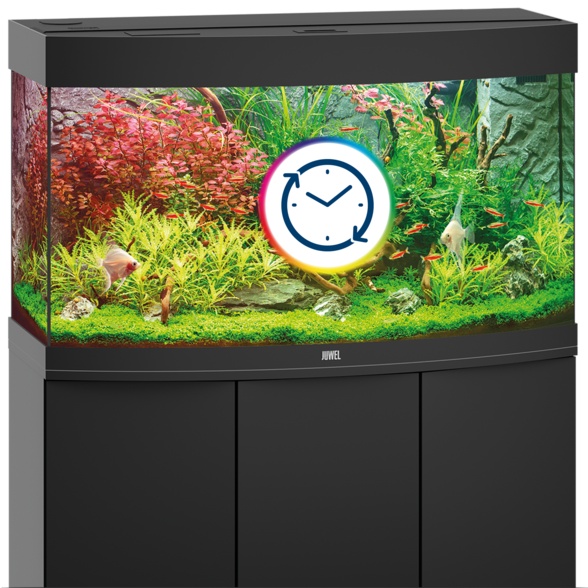 Each JUWEL aquarium of the model series Lido, Rio, Vision and Trigon is equipped with a MultiLux LED comprising an LED DAY and an LED NATURE as standard. JUWEL Aquarium offers two further LED tubes for your saltwater aquarium that you can use by simply replacing the existing LED tubes. Both the LED MARINE and the LED BLUE are designed to recreate the lighting conditions of a coral reef and they specifically promote the growth of your corals. The LED MARINE with its brilliantly white 14,000 Kelvin light provides for bright conditions, while the LED BLUE creates fascinatingly deep blue tones. Can I also use the HeliaLux LED/HeliaLux Spectrum in aquariums from other manufacturers? The UniversalFit holder allows for the HeliaLux LED / HeliaLux Spectrum also to be used in aquariums from other manufacturers. Is the HeliaLux Spectrum also suitable for saltwater operation? The HeliaLux Spectrum is only suitable for use in fresh water aquariums. It is not suitable for saltwater aquariums. We recommend the MultiLux LED with the LED lighting media Marine and Blue to provide for ideal conditions in saltwater aquariums. What is special about the HeliaLux Spectrum compared to the MultiLux LED? The HeliaLux Spectrum is a specially developed full-spectrum LED with maximum performance. Special red, green and blue LEDs have been employed in the HeliaLux Spectrum to create intense colours and maximum contrast. They cover the full spectrum and are ideal for supplementing the light-intense white 9000K and 6500K LEDs. When combined with the HeliaLux SmartControl, they enable you to adjust the lighting conditions in your aquarium to meet your requirements. In addition to sunrises and sunsets, you can easily programme lighting phases. The MultiLux LED that is installed in the factory (from 2017) is not dimmable. By switching to the HeliaLux system (LED or Spectrum) combined with HeliaLux SmartControl you are able to implement individual daily sequences and dimming curves. How can I add more light to my Primo aquarium? The Primo series features a NovoLux LED White as standard. You can upgrade your aquarium’s light system by placing up to three NovoLux LED lamps in the cover. In addition to the NovoLux LED White that provides for attractive lighting and promotes the well-being of your fish and plants, you are able to highlight the red and blue tones of your aquarium using the additional light units NovoLux LED Red and NovoLux LED Blue. The additional lamps can be simply attached to the cover, using the included clips. The NovoLux LED can furthermore be operated with a suitable controller. Sunrise, sunset and the duration of dimming can be programmed individually. What is the standard lighting system that is integrated in all Primo LED aquariums? The Primo series features a NovoLux LED White as standard. This light unit is particularly energy efficient and it meets the requirements for operating an aquarium. In order to increase the satisfaction of your individual requirements, you can upgrade your aquarium by placing up to three NovoLux LED lamps in the cover. How often should I replace my LED tubes? LED lighting media have a longer service life than conventional fluorescent tubes. The NovoLux LED, MultiLux LED, HeliaLux LED and HeliaLux Spectrum have a 2 year warranty from the date of purchase. What is the standard lighting system integrated in the model series Lido LED, Rio LED, Vision LED and Trigon LED? 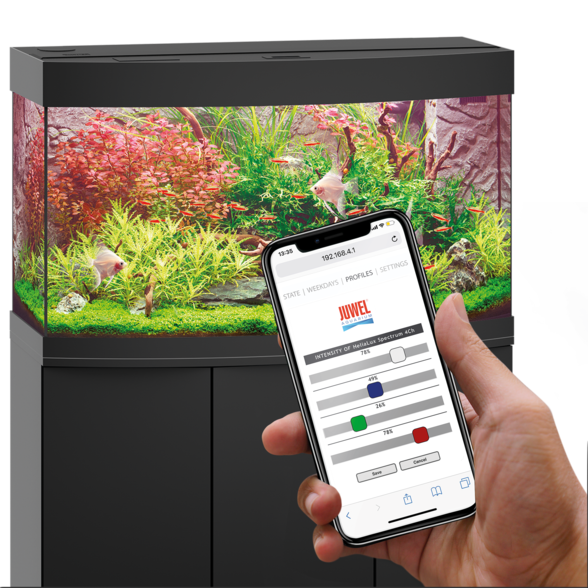 Each JUWEL aquarium of the model series Lido, Rio, Vision and Trigon is equipped with a MultiLux LED comprising an LED DAY and an LED NATURE as standard. This provides for brilliant lighting and excellent plant growth. The replaceable tubes create an optimum light spectrum, while saving up to 50% of energy compared to conventional T5 light units. While the LED DAY highlights your animal and plant world with its bright and stimulating light, the LED NATURE provides for a warm and natural light that promotes photosynthesis of your plants and brings out the green tones in your aquarium. Can I convert my HiLite T5 light unit with T5 HiLite fluorescent tubes to LED operation, by inserting LED tubes? It is not possible to replace a T5 HiLite fluorescent tube with an LED tube. The MultiLux light units may look identical, however, they feature different integrated control units for the fluorescent tubes’ ignition voltage. Each control units is designed for the specific light unit. If you would like to change to LED operation, you should buy a designated MultiLux LED light unit or a HeliaLux light unit. Both products are a perfect match for your aquarium and they are quick and easy to install. What is special about the MultiLux LED compared to the T5 HiLite fluorescent tube? The MultiLux LED features a higher light intensity while saving up to 50 % of energy compared to conventional T5 technology. Further advantages of the MultiLux LED include a longer service life of the LED tubes, and durable light quality compared to T5 fluorescent tubes. How often should the socket rings be replaced? To ensure waterproofness of your JUWEL aquarium light unit, we recommend that the fitting rings are replaced once a year. When using a T8 or T5 light unit, the fluorescent tubes should also be replaced on this occasion. How long is my warranty for items from JUWEL Aquarium? 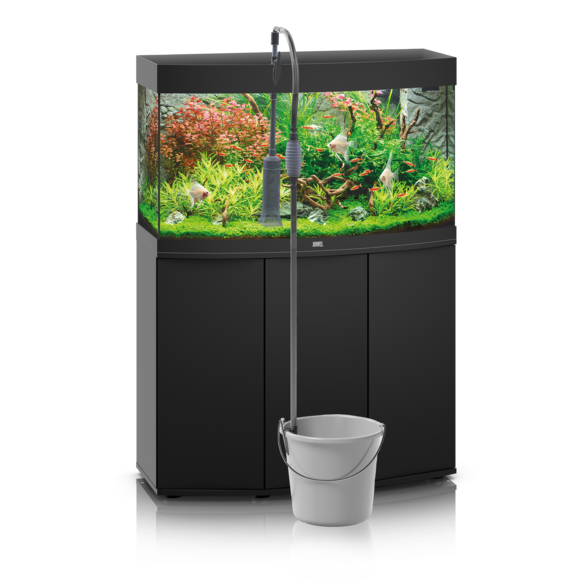 Our warranty period for all parts of the aquarium is 2 years from the purchasing date. Filter sponges and fluorescent tubes T5/T8 as well as all components that are subject to normal wear, e. g. the impeller of the pump, are excluded from the warranty. The basis for the warranty is the availability of a valid proof of purchase. What is the spectrum of my T5/T8 fluorescent tubes or my LED lighting media? The spectrum of the T5/T8 fluorescent tubes or the LED lighting media is printed on the respective packaging and you can also find it in the image gallery on the product page. Do I generally need reflectors? We recommend the use of reflectors for T5 and T8 fluorescent tubes for two reasons: Reflectors increase the illumination by 100% which is particularly positive, especially in case of plant aquariums. In addition, they serve in a very convenient manner as a visor which simplifies the maintenance of the aquarium a great deal. All steps in the aquarium may be performed in a more successful and comfortable manner under full illumination. LED light units (such as the MultiLux LED, NovoLux LED, HeliaLux LED, HeliaLux Spectrum) do not require reflectors. The LED light units are already optimally adjusted to the aquariums and they have an ideal beam angle. 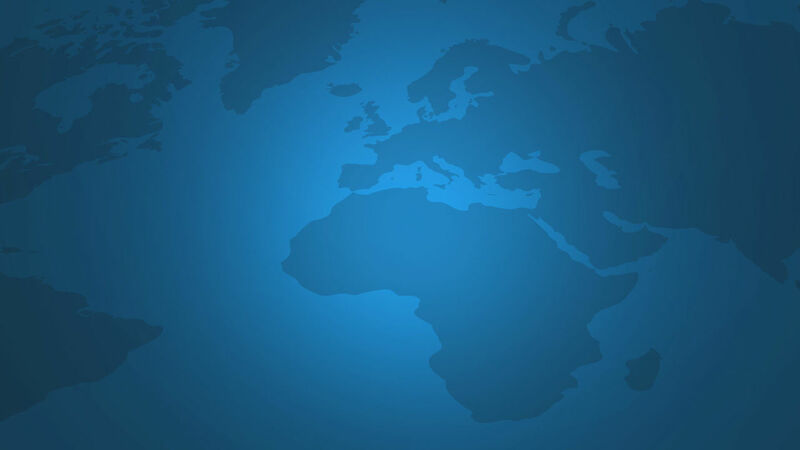 Quickly and easily find the right answers to your questions relating to JUWEL products. Our "question and answer database" contains useful tips and answers to frequently asked questions.